Braving the winter chill, thousands of Tibetans and locals lined up along the roads leading to the Tawang monastery on Sunday and gave a rousing reception to the Tibetan spiritual leader the Dalai Lama, who arrived in town on a four-day visit. 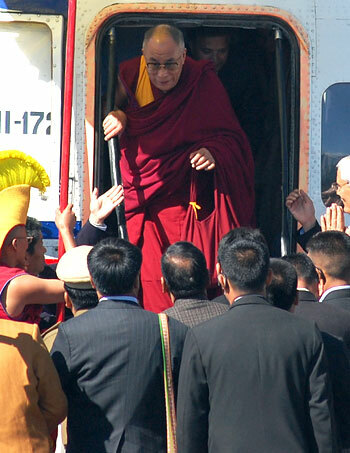 After his arrival by a helicopter from Guwahati, the 74-year-old Dalai Lama, accompanied by Arunachal Pradesh Chief Minister Dorjee Kandu, was welcomed by cheering Tibetans as he drove along the 10-km stretch from the helipad to the 400-year-old Tawang monastery. The Dalai Lama's cavalcade stopped at three places -- old market, Manjusree Vidyapeeth and new market -- as the spiritual leader blessed the people who greeted him. An 'emotional' Dalai Lama has out at China for opposing his visit to Arunachal Pradesh and expressed surprise over Chinese claims to Tawang. Nestled in the snow-capped mountains and perched at a height of 10,000 feet, Tawang town wears a festive look with colourful posters with the Dalai Lama's pictures and Tibetan and Indian flags flying everywhere. Buildings and houses have been given a fresh coat of paint and streets and localities cleaned to mark the occasion. 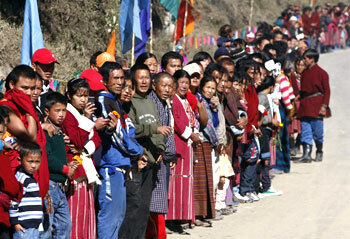 The Dalai Lama's cavalcade took more than 45 minutes to reach the Tawang monastery from the helipad. 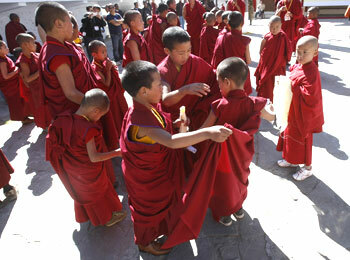 Image: Monks at the Tawang monastery had reasons to cheer. The Tibetan spiritual leader, who is in town for the first time since 2003, inaugurated a museum inside the Tawang monastery. The museum named 'Gadenmamgyallhatsa' contains historic Buddhist scriptures. Soon after the inauguration, Dalai Lama was taken in a procession from the entrance to duakkan that was attended by 700 Buddhist monks. 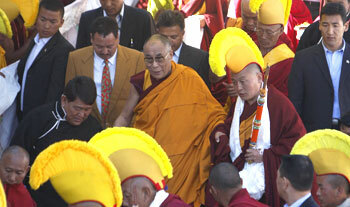 Accompanied by Kandu and spiritual leader P G Rinpcohe, the Dalai Lama went into to the duakkan to offer prayers. Tawang, the 400-year old and the second largest Tibetan monastery in India, holds personal history for the Dalai Lama. On Chinese opposition to his visit, the 74-year-old Dalai Lama said, "That is quiet usual. Wherever I go they protest. It is totally baseless. The Chinese Communists turn quite sad usually on my every movement. Of course my visit here is non-political." On his visit, he said he was getting "emotional" as he had crossed this town in 1959 while fleeing from Tibet. "I get emotional. When I escaped I had mental stress and anxiety. I had feeling of hopelessness. But the moment I saw (Krishna) Menon and other MEA officials on the border then I had a feeling of reunion and safe," the Dalai Lama said. "So, now I am very happy to be here. My main aim of the visit is promotion of human values wherever I go. Just now I returned from Japan [ Images ] where I explained that the ultimate source of happiness of life is within ourselves," he said. Asked whether he had any message for China, he said, "Nothing, no, nothing."